A visual look at how Routific works. Driving from point A to B is one thing, but many businesses have an alphabet of destinations to get to every day. When delivering, say, furniture to 50 different houses with a handful of trucks, planning the best route isn’t simply a matter of plugging addresses into Google Maps. 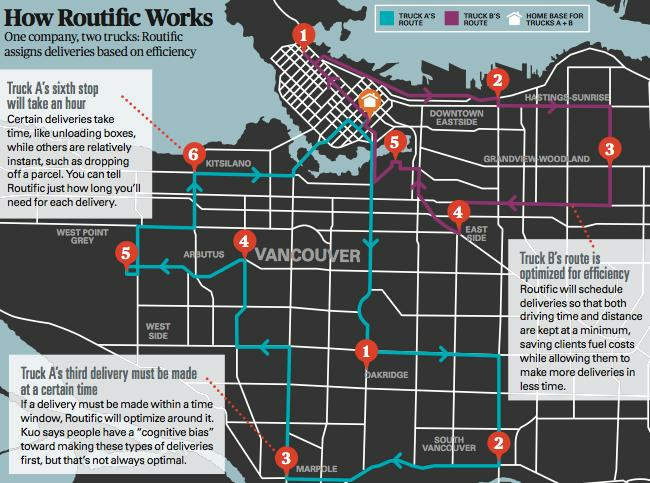 But now it can be thanks to a Vancouver startup, Routific, whose tech lets companies update their numerous daily destinations online and have an algorithmically optimized route returned to them in a matter of seconds—one that requires the least amount of driving. Big firms like UPS and FedEx already have their own algorithms, but Routific co-founder Marc Kuo saw an unmet market of smaller businesses that would benefit from the same tech—but didn’t have the in-house resources to develop their own algorithms. And so for $29 per vehicle per month, Routific offers its. “We’re a startup that helps other startups,” explains Kuo, 28. His company guarantees its tech will improve the efficiency of routes by 15 per cent. Routific is now seeing revenue double each month, says Kuo, who’s received dozens of emails from interested investors. Routific is being funded by Axiom Zen, a local startup accelerator, to the tune of $500,000. 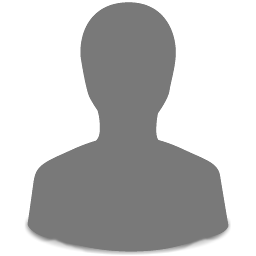 A polished version of its tech will go live this winter, allowing clients to access everything through a sleek interface online, from any mobile device (current clients receive raw data). Customers come from around the world—a laundry service in Paris, a French baker in Hong Kong—but “one of our greatest early adopters” is local, says Routific’s other co-founder, Suzanne Ma. Vancouver-based Frogbox, which delivers tote boxes for moving, has been testing Routific since summer and now plans to use it with all its Canadian franchisees. “We’re saving time, especially when we have two trucks,” says Mathieson McCrae, Frogbox’s Vancouver general manager. That’s not just saved money—it’s better for the environment.